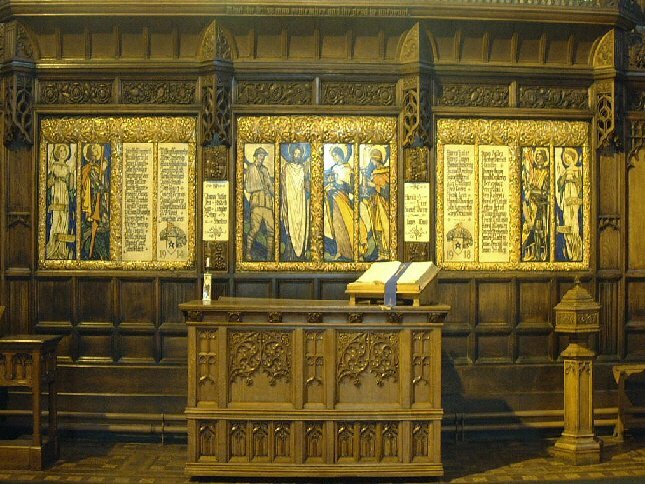 The central panels have as their motif the Sacrament of the Lord's Supper, and many of the aspects of that great Christian ordinance can be traced in the ideas that lie behind the symbolism. There is Christ Himself as the great sufferer, and yet the giver of immortality; there is the Christ who calls others to suffer, and who yet is the secret of their life; there is the thought that suffering willingly endured for a great ideal is one road to closest communion with Himself. More plainly still, the central panels are intended to represent Christ offering the sacrament to those whose lot it was to be called upon to make the supreme sacrifice in the war. The first panel shows a wounded soldier, who is representative of the many connected with the Church who laid down their lives in the cause of freedom. The second panel shows Christ gently leading the soldier to the cup of suffering he has elected to drink - represented in the third panel: that he may gain immortality - typified by the figure with the light in the fourth panel. On the left of them is the figure of St. George -the soldier-saint of England. On the right, the figure of St. Michael, the leader of the hosts of Heaven that war against the Evil One. Both saints have their attendant angels, represented by the end figures on either side. On both sides of these central panels are the names of the fallen -57 in number. "That the living may remember and the dead be unforgot.". This canopy is to be finished in Dantzig oak, to be in keeping with the rest of the woodwork in the Church, and the work is being carried out by Messrs. Hatch & Sons, of Lancaster, to designs by Mr. T. Baines, Church Architect, of Shrewsbury. In 1893 four brothers, members of the Pilkington’s family (the same family that set up Pilkington Glass) established a separate company to mine for coal in Swinton near Manchester. Instead of coal they found clay and changed the venture into a tile making company. They recruited William Burton from Staffs (Wedgwood) as a charismatic manager. With Burton came other famous artists and his brother Joseph a first-class chemist. This was new age of scientific discovery and Pilkington’s were the first of the “scientific” potters to harness the newly discovered periodic table to control their glaze effects. In 1904, the Lister Drive baths in Liverpool, which were completed in Voysey Tiles. By 1920, Pilkington’s had completed an incredible work for Liverpool Museum featuring five enormous tile panels. By 1920 Pilkington's had built up a sales network in every continent. The tiles in the Albion memorial were designed and probably painted by the ceramic artist Gordon Mitchell Forsyth. Forsyth came to Pilkington's in 1906 to be the head of their celebrated artists department he already had a first-class reputation and it was quite a coup for Burton to recruit him. Forsyth left Pilkington's shortly before this commission was installed. He went on to become a celebrated teacher and head of the school of art in Stoke. Forsyth was profoundly affected by the First World War he served in the RAF and lost many friends and colleagues in the war. He used RAF wings to designate one year of his pots. Salford museum and Art Gallery have a huge lustre vase known as the Peace vase. The first record that we have concerning the decision of the church may be found in the deacon's minute book for January 9, 1919. The work professionally was to be placed under the control of Mr. J H Cronshaw who was an Associate of the Royal College of Architects of Ashton-under- Lynne. This price is in line with the costs of the Liverpool panels though this work is very different in style. We have never been able to trace the final costs of the panel. By December 1920 it is recorded that £500 had been put aside for the venture. The Church authorities made it clear that there was a purpose to the design. What they wanted to achieve was a way to balance the dazzling nature of the Burne-Jones windows. They felt at the time there was what they described as an "unrelieved gloominess behind the communion table"
And that something was called for that created "lightness and brightness in the colour scheme"
They said " the keynote should be such as occasionally to arrest attention." Also just as the stonework frames the windows, so they wanted to continue this theme with the panels – hence the elaborate frame around each individual panel. They concluded that the finished result conveys a sense of beauty, and I am convinced that everyone must soon feel the Memorial as an integral part of the Church itself. The memorial was unveiled on October 2nd 1921. The Reverend Parnaby performed the service. The names of the fallen were recited and two buglers from the 9th Battalion Manhester Regiment sounded "The Last Post". Two later panels were added after the second world was. We have not researched the records for these but we know again that trials were made at Pilkington’s to ensure the lettering matched. Thanks to Barry and the Pilkington Pottery Society for researching the content for this page.